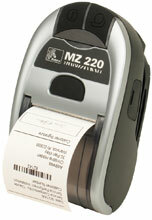 Zebra MZ220 - Direct thermal, 203 dpi, 2" width, 3 ips, unlinered platen, Bluetooth interface. Includes battery and charger unit. The Zebra M2E-0UB00010-00 is also known as ZEB-M2E-0UB00010-00	or M2E0UB0001000	.